A proposed bill in Washington, where Democrats control both chambers of the Legislature as well as the governorship, would make the state second in the U.S., after California, to impose a statewide ban on single-use plastic bags. 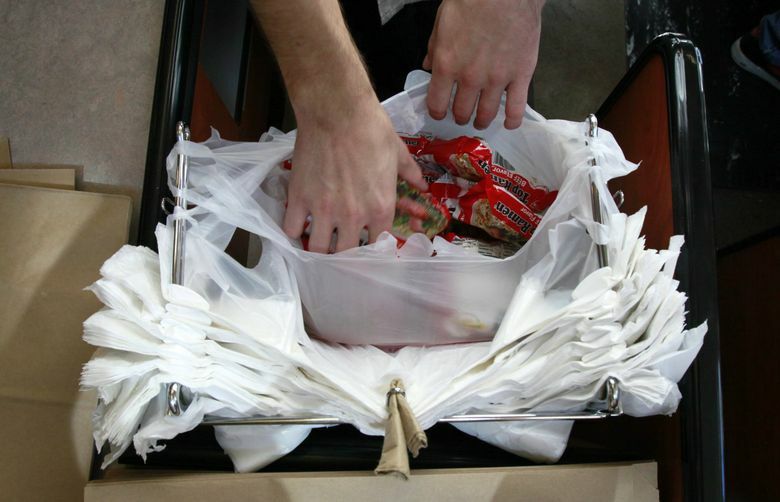 Democratic lawmakers in Washington state said Wednesday that they plan to pursue legislation to ban single-use plastic bags, like the ones used in grocery and retail stores. The measure would eliminate all plastic bags used for purchases and levy a 10-cent fee on paper bags, backers of the bill — Sen. Kevin Ranker, D-Orcas Island, and Rep. Strom Peterson, D-Edmonds — announced in Seattle on Wednesday. They plan to introduce their bill in the Legislature’s next session that starts in January. The bill’s passage in Washington, where Democrats control both chambers of the Legislature as well as the governorship, would make the state second in the U.S., after California, to impose a statewide ban on single-use plastic bags. State politicians regularly boast of having some of the strictest environmental regulations in the nation, but they’ve also been criticized by environmental groups for not doing enough. Puget Sound water pollution, for example, was cited by National Oceanic and Atmospheric Administration biologists as one of the factors that have led to the plight of endangered southern resident killer whales. The bill’s text has yet to be finalized. But according to Peterson, grocery stores will keep the 10-cent fee on the paper bags to help with the transition. The bill is supported by Safeway, Albertsons and the Northwest Grocery Association, Ranker said. Still, not everyone thinks the proposed measure is a good idea. Todd Myers, environmental director of the Washington Policy Center, an independent think tank that says it “promotes sound public policy based on free-market solutions,” doesn’t think a plastic bag ban is the best way to fight pollution. Myers cited a 2011 study by the U.K. Environmental Agency, which concluded that the use of cotton bags had the biggest environmental impact out of seven types of bags studied, including single-use plastic bags. That’s mostly because of the energy required to grow cotton, it said. Instead of banning plastic bags, Meyers says the state should promote the use of biodegradable plastic bags. Dozens of Washington cities, including Seattle and Tacoma, and counties such as San Juan and Thurston, have already banned plastic bags. The 10-cent fee Ranker and Peterson plan to include in their measure is meant to encourage shoppers to bring their own reusable tote bags. There will be exceptions for low-income residents, Ranker said. Besides Washington and California, Hawaii has a de-facto statewide ban on plastic bags. That state’s most-populated counties prohibit non-biodegradable bags, according to the National Conference of State Legislators.